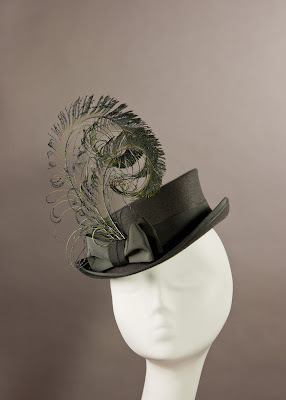 Inspired by the quirky, asymmetrical 'doll' hats popular just before and during World War II, this slightly mini top hat shape is shorter on one side and taller on the other, with the brim canted at the opposite angle, and the crown tilts forward like a little Alice in Wonderland teacake about to topple over. I made this sample in a gorgeous charcoal gray fur felt with black and gray ribbon trim. Dressed up with peacock sword feathers, dyed to match the felt and curled into spirals. I've been collecting vintage hats for almost 25 years and my all-time favorite was made by a Parisian Milliner named Yvette Delort: a little late-1930s 'doll' top hat that is asymmetrical, has a ruched silk lining and a silk plush exterior (rare for the period), and is entirely hand-sewn. This hat has seen better days, is a bit squashed and rubbed around the edges, but it's my Velveteen Rabbit of hats: a little pal, my millinery mascot, bursting with personality. If my house was burning down, it's one of maybe 10 things I would try to grab on my way out the door. The more I learn about hat making and the more I look at this hat, the details and fine workmanship that went into it, the more I'm convinced that the person who designed it was a genius. Here's a photo of the lovely young Mlle. Delort looking gorgeous wearing one of her own creations, circa 1931. Yvette Delort opened her shop in Paris in 1930, and there are a handful of references to her in the fashion magazine L'officiel de le Mode from the 1930s. I suspect that she probably was working in someone else's millinery shop before that, given the Victorian or Edwardian characteristics of the hat (the way the lining is sewn together, the materials chosen, etc. 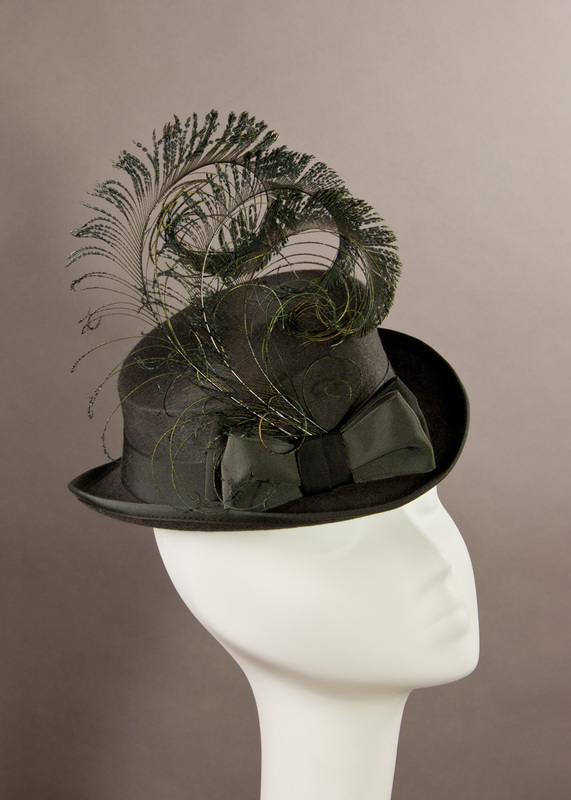 ), she obviously learned the trade and traditional techniques from other milliners of long standing. 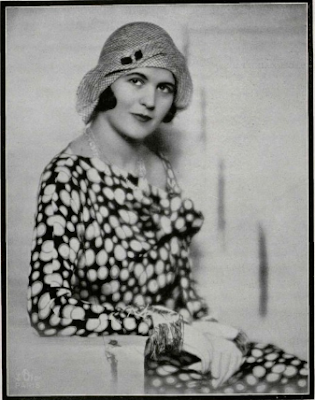 She was clearly still working through the 1930s-- my hat's shape is spot-on for the particular style of 'doll hats' that were popular right before the war-- but as yet, I have found no trace of Yvette Delort after the late 1930s. Perhaps she was one of the many French fashion workers who closed up shop at the start of the German occupation in 1940, and like a large number of them, wasn't able to recover enough financially to resume her business after the war was over. So, I wanted to create a hat inspired by my little vintage favorite and the lady who made it, and turned to my custom hat block maker, Owen Morse Brown at Guy Morse Brown Hat Blocks, to design a set of blocks in the same vein. As usual, GMB came through for me with a fantastic work of art. Owen is as talented as all get-out. The 'Yvette' is not an exact copy of the vintage Delort hat, but an homage to it. I'm looking forward to experimenting with the 'Yvette' blocks to make hats in lots of colors and different types of felt (I'm planning one for myself in pea-green for daywear). While it is still a mini hat, it's a bit larger (in terms of head size) that the 'Belle Epoch' mini top hat that's been my best seller, and only half as tall. It should work better as a cross-over day-to-night hat than some of my other, more costume-y styles. More photos coming soon, it looks even more striking in shiny long-napped 'beaver' felt! 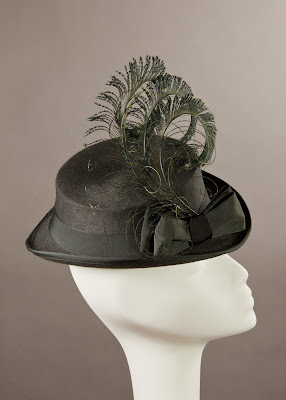 ADS Hats has the charcoal gray one pictured in stock, and Dark Garden has one in black long-napped fur felt with black trim for sale right now.